The locals call it ribinoù – a Breton word that defines anything that is not good-quality tarmac: from silty farm tracks to heavily potholed lanes with grass growing down the middle. Last month’s Tro Bro Léon included 25 varied sections of these. The local paper describes the race as Brittany’s Paris-Roubaix, but that is perhaps looking at it too one-dimensionally. While its hallmark cart tracks take the race through the agricultural hinterland, it also periodically skitters along the jagged coastline of this westernmost tip of mainland France: a place that takes its name from the end of the earth – Finistère. Along the way, there are both rolling hills and exposed flat whipped by a salty wind straight off the crashing waves of the Atlantic. Under the area’s big skies, the race route also takes in a delicious cocktail of abandoned farmhouses, lighthouses, sleepy towns, withered trees, gorge-flanked verges, seafood restaurants, farmyards, war battlements, fishing villages, estuary bridges and field after field of Friesians eyeing the peloton as it buzzes past. Every now and then, the race passes a Celtic cross or an ancient menhir while tall spires mark far-off towns on the horizon. Towards the finish, one particularly muddy sector takes the race through the leafy grounds of a chateau while the cart track that follows passes under a main road through what looks like an oversized drainpipe. Taking place on the same day as Amstel Gold, it’s not the biggest race in the world, but the locals love it, turning out in their gardens and in small pockets on corners as the UCI 1.1-ranked event disorientates itself in the local myriad of lanes. 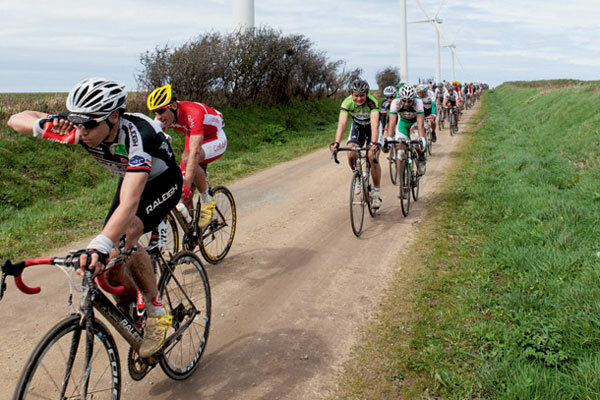 “In Brittany the public know and love their cycling,” noted Team Raleigh’s Eric Berthou, a Breton who last year finished second in the race and took 25th this time round behind lone victor Francis Mourey (FDJ). 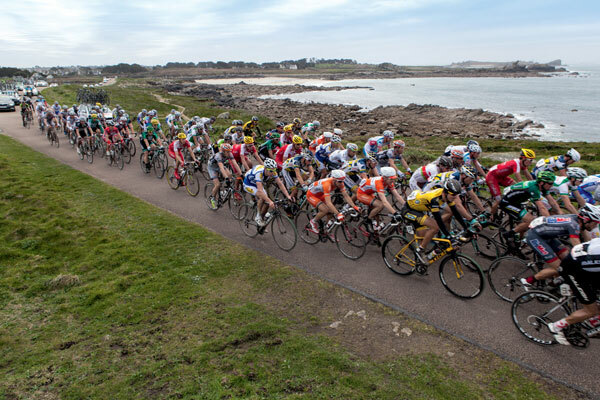 Organised by Jean-Paul Mellouet – a charismatic local Breton with long silver hair who does all the race’s promotional artwork including a cartoon in the programme – it was first run in 1984 and counts Jacky Durand, Baden Cooke and Mark Renshaw among its winners. Philippe Gilbert and Samuel Sanchez have also both been on the podium here. The misfortune that can befall participants was even apparent in the neutralised section when two outriders’ motorbikes slipped in mud and almost brought the field to a halt. Some 203km later, like Roubaix, the finish line was awash with tales of crashes, punctures and riders having blown to bits. Britain’s Raleigh team had come meticulously prepared with each sector recced, every set of wheels they owned on course and 26 local helpers out on the ribinoù armed with spares. Berthou and Alex Blain both featured strongly towards the finale but then, in Berthou’s words, “exploded” on the finishing circuits around the town of Lannilis. In the end, this year’s result very much belonged to FDJ, with Mourey, Johan Le Bon and Anthony Geslin all filling the podium.